2 Bedroom House For Sale in Sheffield for Guide Price £110,000. 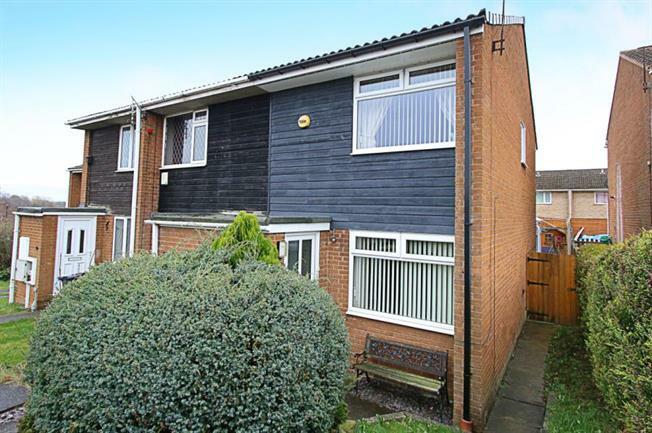 An internal inspection is strongly recommended to appreciate this well presented two bedroom End Townhouse benefitting from NO ONWARD CHAIN INVOLVED, uPVC double glazed windows, gas central heating and conservatory to the rear. The ideal purchase for a first time buyer or investor alike. Standing in gardens to front, along with rear with allocated parking and garage to the rear. Situated within this ever popular and convenient residential area ideally placed for a host of local amenities, nearby Crystal Peaks Shopping Centre, Sheffield Super Tram Network, M1 Motorway and Sheffield City Centre. An early viewing is highly recommended. In brief the accommodation comprises; the entrance door leads to the porch, in turn through to the open plan Lounge/Dining Room with stairs rising to the first floor landing and leading through to a rear facing breakfast kitchen having a range of wall and base units with gas cooker point, along with space and plumbing for an automatic washing machine and integrated wine cooler. A door from the kitchen leads into the conservatory having self-cleaning glass roof and rear facing French style door leading out onto the rear garden. To the first floor landing is a storage cupboard and loft access and there are two double Bedrooms, the master bedroom having a range of built in wardrobes. The modern family bathroom is fitted with a three piece suite in white comprising wash hand basin, low flush wc and bath with shower screen above and mixer tap shower attachment. Tiling to the splash backs, tiling to the floor and ladder towel radiator. Outside: The property has a front lawned Garden and enclosed low maintenance garden to the rear with Patio area. Gated access leads from the garden to a garage providing storage and or off road parking space. Location: Westfield is a popular area boasting excellent links to both Sheffield and the M1 Motorway networks, local amenities include Crystal Peaks Shopping Centre, Rother Valley Country Park and Sheffield Super Tram networks as well as superb bus links. The area is well placed for local schools and amenities in the surrounding areas.